Apparently baked applesauce has been around for years--how did I miss that issue of Bon Appètit?--but I didn't give it a thought until I happened onto the wonderful blog Circle B Kitchen. 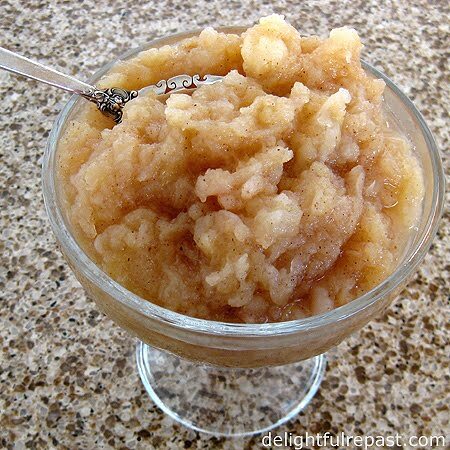 I really like the level of sugar and spices in my own applesauce recipe, so I stayed with that and used my own variation on the baking method Patrice described. 1 Preheat oven to 375 degrees. Spray 18x13x1-inch half-sheet pan* with cooking spray. Place the apple halves cut side down on baking sheet and add water to pan. 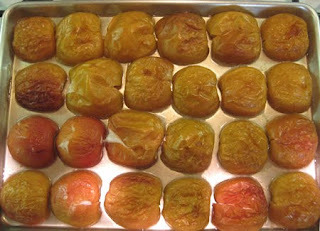 2 Bake, uncovered, for 45 minutes, until the apples are wrinkly and falling-apart soft. Remove from oven, and leave the apples in the pan. I didn't want to wait till the apples were cool enough to handle, so I just used a dinner fork and soup spoon and mashed each apple half in its place in the baking sheet. 3 Leaving apple halves skin-side up, mash them completely down with fork (one at a time). All the soft apple will squeeze out and you'll be left with a clean piece of peel to discard. Sprinkle the mashed apples with lemon juice. 4 In small bowl, whisk together sugar, spices and salt. Sprinkle the warm apples with sugar mixture. Keep stirring until all sugar is dissolved. 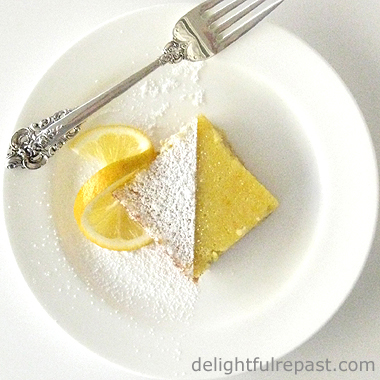 If too dry, add a little water one tablespoon at a time. 5 Serve warm, room temperature or chilled. The following are good sauce apples: Golden Delicious, Macintosh, Empire, Rome, Macoun, Pink Lady, Jonathon, Jonagold, Gala. *If you don't have one of these Sheet Pan Half Size - 12-7/8'' x 17-3/4'' Heavy Duty, 13 Gauge, you need to get one right away! Ohhh that looks so good. I've never made my own applesauce before. I'm going to have to try this! Thanks, Colette. I hope you will try it. It's so easy and so good. And the apples didn't even stick to the pan at all. Clean-up was a breeze. Think I would like this with raisins in it, or maybe some kind of oatmeal crunch, granola, etc. Bet it would go good with oatmeal cookies as a kind of chaser. Sully, good ideas! I definitely like it with granola, so I'm sure it would be a great chaser with oatmeal cookies. It's perfect with pork. I just found your wonderful blog, and have signed up to follow it. I can't wait to read all of your creative posts! Thanks, Linda! I post only on Friday morning, with the rare exception. Just stirred up another batch of eggnog--I posted my recipe last Friday--and am taking a tea break. What an interesting twist on applesauce! You reminded me that I have many jars of applesauce from our McIntosh tree (my favorite apple!) that I need to be using. Thanks, Judy! Better late than never! Love that photo. I'm going to use it somehow on my blog with a link back to yours (if that's okay with you?). I love this idea! I have not actually made my own applesauce, though I keep threatening to do it! This looks wonderful Jean! You're going to love it. 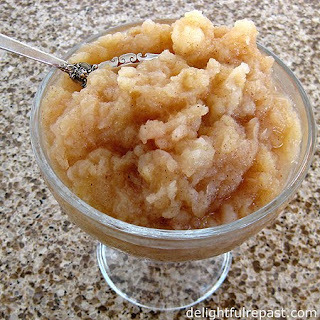 Once you've made your own applesauce, you won't be happy with store-bought. But that's okay because homemade is so easy. Jean, I love the idea of getting the applesauce going without having to peel all of the apples. I'm going to try this tomorrow! Thanks for the idea and the great pictures. Thanks, Kim! That's exactly it--sometimes you just want to "get something going" without a lot of fuss and bother. This looks ace. I'm used to just slowly let it boil down in a pan with some additions. Doing it this way looks like it will add some extra dimensions of flavour. I'm going to have to give this a go next time. Many thanks for the inspiration! Mike, thank you! I think you'll really like it. Besides the ease of preparation, it really does, as you say, add some extra dimensions of flavour. And that is always my main consideration! Can you make a sauce with Cox's Orange Pippins? Years ago in England I had some juice from that apple, and it was the most flavourful apple juice I've ever had. Don't see it here. I'd give it a go with the Cox's Orange Pippins but might mix them up a bit to get a more round flavour. Yesterdays apple sauce was made with Granny Smiths' - that was what was at home and I couldn't be bothered to go and get some coooking apples. Worked just fine. I usually use two varieties, don't like to mix too many, but sometimes a single variety needs a "little something" from another, doesn't it? What an interesting way to make applesauce. It does sound better than peeling them all! Carlee, thank you. I do hope you'll try it. It's really so much easier *and* better than peeling and boiling.